You upload your videos to your own YouTube channel, (something you are probably doing already), then provide us with your YouTube Channel Name. That’s it ! We’ll do all the rest. Each video will be loaded on our Video Hosting Site. This will not in any way change or disrupt your existing YouTube video. A new Facebook and Twitter post will be created and sent to our Facebook pages and Twitter channels, all specifically geared to traders and investors. The post will show a thumbnail image of YOUR video only. 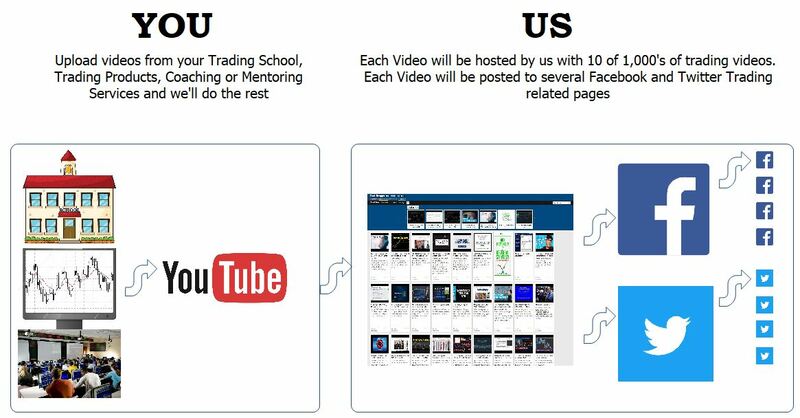 When clicked, the user will be taken to TradeBraggerVideos.com, our Video Hosting Site, and your video will play. Each video will be posted for our entire Social Media following and shown to hundreds of thousands of traders and investors. The user can watch the video on our site or select to watch it on YouTube; either way the view will count as a view in your YouTube stats. Is there a contract or minimum requirement? No contract, all plans are month to month, you can cancel any time. Are there restriction on the video content? What is the size of the Social Media Followers that will see my video? 15 Facebook pages, 3 Twitter Channels, for a total of approximately 20,000 followers. External ‘boosted’ posts paid for advertising on Facebook targets an additional 100,000 outside of our network. Can I re-post the same video, or use an old video I may have created in the past? Yes, absolutely. Re-upload the video and change the name. Our system will pull in the video as if it were new. Will my video play directly in Facebook or Twitter? No. Users will see a thumbnail image of your video, and when clicked will be taken to a web page that hosts your video only. Will a video view on the hosting site count towards a YouTube view? Yes, each view counts as a view in Youtube. Can the user chose to view the video on YouTube Directly? Yes, they are given the choice to watch either on the hosting site, or on YouTube. Can you guaranty a certain number of views? No, I wish we could, but there are no guarantees. See Best Practices below, to increase your results. How long will my videos remain on TradeBraggerVideos.com (the hosting site)? Permanently, even if you cancel your account, we will not remove your videos (except for violation of TOS). Your videos will continue to be viewable and searchable by all users. Why should I use your service as opposed to just posting to FB and Twitter on my own? There should be no reason to stop posting to your own channels. The benefit of Social Media is to broaden your exposure. Chances are, your posts are being seen by the same people over and over again, and organic growth can be painfully slow. If you offer Options Trading Strategies, and you regularly post about Options, you are showing the same video to the same people who have shown interests in Options. Once your video is live on our site, it will be shown to Stock Traders, Investors, Forex Traders, etc. The benefit is in the overlapping segments. A Futures Trader may very well be looking for an Options Product like yours. Our industry experience has shown that buyers in one category are many times more likely to buy in another category. e.g Stock Traders, looking for Options Products. Can you suggest some Best Practices to increase traffic to my product and services? Yes, I’m glad you asked. DO – Post often, it’s all about exposure. DO– Re-post and re-use existing videos, it will lighten your work load, and there is no guarantee it was viewed the 1st time around. DO – Post a video from a few years ago. It shows staying power; buyers do not want a fly by night operator. DO – Include a link below your video to your home page, signup page, Social Media page, special offer. DO – Post an industry required risk disclaimer and results disclaimer. It does not matter what system, service or venue you use to post trading and investing information, YOU must include the necessary disclaimers below your videos, on your website, in your TOS. DO – Post good quality, content rich educational information. DON’T – Violate the TOS by posting content that is in bad taste, prohibited, inappropriate, or illegal. DON’T – Post absurd claims. DON’T – Post negative hurtful or destructive content about someone else, it will be removed and you could be held liable. DON’T – Post sales videos, that is not the purpose of the site, feel free to a include a link below an informational video to your sales, or sign-up page. DON’T – Post videos that are not related to Trading or Investing.